Here’s one from the dusty longboxes. I’m sure all of you, even new fans, are aware of the pivotal Crisis on Infinite Earths. Due to the relatively recent trade releases, you may have also read the excellent Justice League International volumes. In between that ongoing series (and during the Post-Crisis revamps of Superman, Wonder Woman, and Batman, along with the rest of the DCU) the miniseries/event Legends helped bridge the multiverse into the new ongoing status quo. 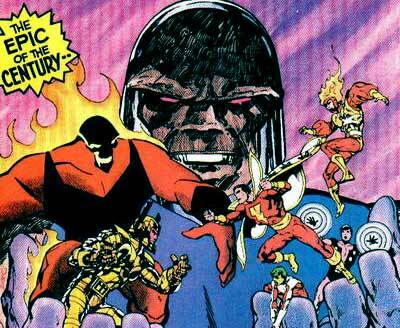 Staring Darkseid and a bevy of DCU heroes, the event set the foundations for a world with a JLI. It’s a nice little stack – perhaps for a long Saturday in a comfy chair. I’m not sure if it’s really the epic of the century (especially coming right after CoIE!) but it’s a bit of history and a fun read. to those who are interested in purchasing a house. idea whether it is entirely me or maybe your web site then again google and yahoo worked for me. Well, I need to thank you so much for putting excellent content. want to check out posts from your site. After viewing the content, I’ve bookmarked your web blog. Ηeya i amm for the first timje here. I found this board and I find It really useful & it helƿeɗ me out a lot. really like what you’re stating and the way in which in which you are saying it.